Winnipeg launch of Disintegrate/Dissociate (Arsenal Pulp Press) featuring a reading and a conversation hosted by Rosanna Deerchild. 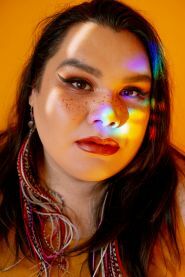 Host Rosanna Deerchild has been storytelling for more than 20 years. As the host of CBC Radio One’s Unreserved, she shares Indigenous community, culture, and conversation. As a poet, she has published two books. this is a small northern town won the 2009 Aqua Books Lansdowne Prize for Poetry. calling down the sky is her mother’s Residential School survivor story and has been translated into Cree and French. She is Cree from O-Pipon-Na-Piwan Cree Nation at South Indian Lake in northern Manitoba. Rosanna now lives in her found home of North End, Winnipeg.